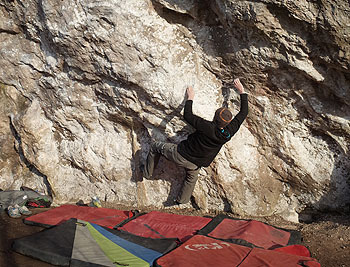 A few weeks back Chris Doyle climbed a cool link line at Craig Ty Mawr, the small limestone venue near Tremeirchion. Enter the Flag 8A continues from the low traverse start of Enter the Dragon across the base of the wall to finish up Flag of Iron. Chris had previously climbed the section from the 36 Chambers sds onwards into Flag of Iron; 36 Flags is a an excellent 7A in its own right. It has a great crux sequence and is nicely sustained afterwards. Also worth noting is the obvious 7A+ right hand version of Lone Wolf, which was climbed by Sheffield raider, Robin Barker back in November. Start as for Lone Wolf using the pocket and then move up right for an ear/biscuit. Lurch back left to match a hidden sloping horizontal runnel in the wall and rock up to jugs to finish.